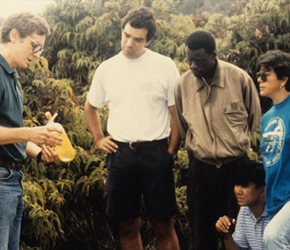 For 1995, we had 5 participants,from Zaire (now the Democratic Republic of Congo), Costa Rica, the Philippines, and the Canary Islands. 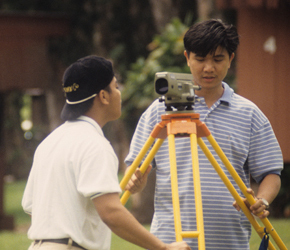 Aristotle Jimenez and Edgardo Andal (Philippines) practice setting up a NAK-2 on the UH Hilo lawn. 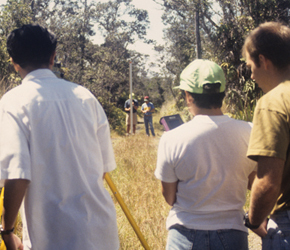 The CSAV crew, coached by Dana Caccamise and Ken Yamashita, runs a precise leveling survey near Mauna Ulu. CSAV guest instructor Mike Bevis listens patiently to questions about the GPS satellite set up at the end of Chain of Craters Road. 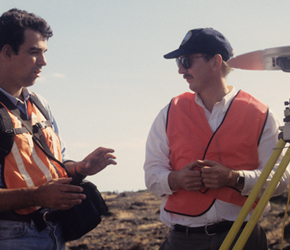 Don Thomas demonstrates the use of a vacuum bottle for collecting volcanic gas in the field. Request more information about UH Hilo.